Not long ago, while browsing LoveLula website I came across Antipodes Juliet Skin-Brightening Gel Cleanser and thought to give it a go since it was suitable for oily and blemish-prone skin, basically for my type of skin. I’ve read some good reviews about various Antipodes products online previously but I’ve never owned any of their products. Not until now. Antipodes are a green beauty brand founded in New Zealand by Elizabeth Barbalich who has built her skincare and makeup company on a cutting-edge combination of the highest quality ingredients from New Zealand nature. Antipodes believe in natural skincare with scientific validation so all their products are heavily tested for their skin-enhancing abilities and if the scientific investigations show that a product doesn’t make any difference to the skin, the company simply stops working on it and the product will never make it to the market. Antipodes are no doubt a very special company with strong beliefs and when choosing their products you can rest assured you will be buying extremely high-quality and premium formulations with ingredients that work. Their speciality is anti-ageing so if you are 25+ their natural products will be especially appealing. My skin is a combination type with oily t-zone and proneness to blemishes and I thought Antipodes Juliet Skin-Brightening Gel Cleanser would be perfect for it. The cleanser contains extracts from New Zealand superfruit kiwi and hibiscus bloom which help to exfoliate the skin, removing any dead skin cells and revealing healthier looking skin underneath. 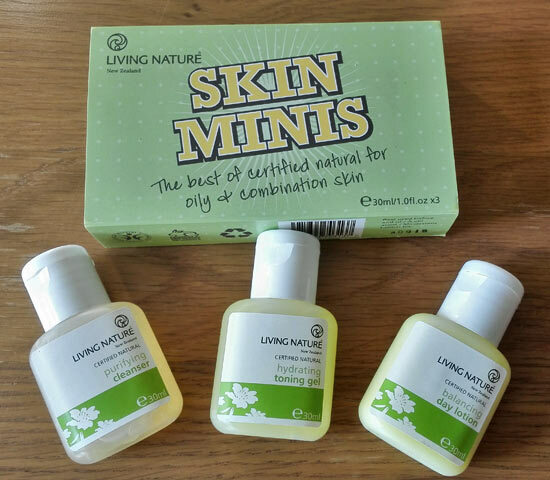 I always love how soft my skin feels after cleansing – these extracts are no doubt working. Surprisingly, the cleanser is not grainy at all so you would wonder how the skin actually gets exfoliated but it does. Another great ingredient in this cleanser which helps to tackle those pesky spots is anti-bacterial and anti-inflammatory manuka honey which helps to eliminate inflammation and redness of acne breakouts, cysts, and pimples. I get spots quite often and anything that would help them clear up quicker is welcome in my skincare routine so this cleanser definitely ticks that box. If you are a new LoveLula customer you can save 15% on Antipodes products, (you also get a free gift), just click here and wait for the pop up to appear). The cleanser leaves the skin very clean after use but it doesn’t leave it tight. It removes makeup well, you just need to make sure you spend enough time massaging it into your skin wherever is needed more. 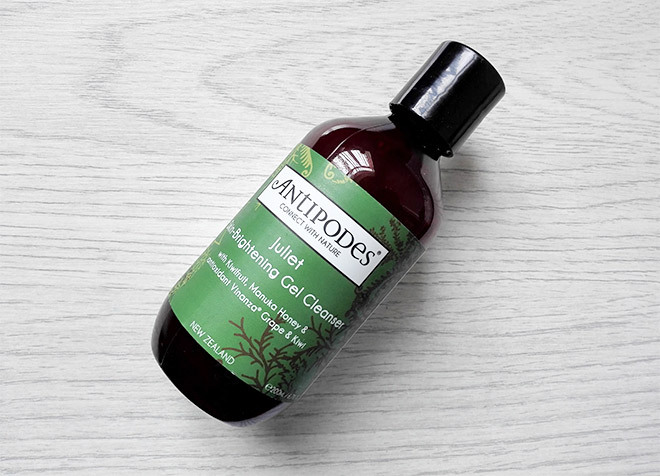 Antipodes cleanser is also suitable for normal skin but I wouldn’t recommend it to those with dry skin as it does remove natural oils (although it does contain skin moisturising ingredients such as glycerine, avocado oil and jojoba oil which counteract that). To use the cleanser, squeeze a small amount onto your hand and then massage it into your skin. You really don’t need much. A little goes a long way. The cleanser is of a weird brown colour but smells quite nice. It starts to foam very quickly once you start massaging it into your skin. Make sure to focus on the areas of concern, especially any blemishes, to help them heal quicker. Take your time to get better results. Although the bottle this cleanser comes in is quite small (200ml), the cleanser should last you quite a long time as you don’t need much for one use. I’ve been using it for about a month now and I’ve used about 1/3 of it (I use it only in the evenings though). If you use it only once a day, it should last you for about 3 months which is not bad at all. Just to add that this Antipodes Juliet Gel Cleanser is certified vegetarian by the UK Vegetarian Society and of course it’s cruelty-free (Antipodes never test on animals). Overall, I found this natural cleanser really good and I have no complaints about it, maybe just one – I think the product would be easier to use if it came in a bottle with a pump. However, I am still happy to recommend it to anyone with combination or oily type of skin. Get Antipodes Gel Cleanser on LoveLula here with a FREE worldwide delivery (remember, first-time customers can get 15% off discount, click here to claim). Have you tried any products from Antipodes yet? What did you think of them?